Angelolatry - The veneration or worship of angels. Angelology - The study or science of angels. Angelophany - The visible or otherwise tangible manifestation of angels to human beings. In many religions such as Judaism, Christianity and Islam, it is believed that between God and mankind there are intermediary beings, called angels. They are bodiless entities that perform certain tasks for God and are commonly thought of as the messengers of God. Angels are good spirits, unlike their counterparts the demons. They are usually portrayed as having a human form, being dressed in long, white clothes, surrounded by a bright light and with long, swanlike wings. They were portrayed thus by artist, often on Church command, to alert the faithful that angels are more than human. There are cases, however, where angels appeared as ordinary men and were mistaken as such (the story of Lot, for instance). In the early stages of mankind, the belief in spirits was universal. The primitive man believed that there were no good or bad spirits. A spirit simply had powers, called mana, with which it could do either good or evil. With the emerging of Christianity and other major religions, the belief in these kind of spirits was condemned, and they became demons. The belief in angels and demons can be traced back to ancient Persian religion where there were two supreme beings: Ahura Mazda and his eternal opponent Angra Mainyu. The first represents good and the second represents evil. Both have followers and servants, angels serve Ahura Mazda, while demons (the Daevas) serve Angra Mainyu. Here the distinction was first made between good and evil spirits. In the Old Testament angels play a prominent role as the messengers from God. Also in the Old Testament the leading demon, Satan, is introduced. However, it was not until the New Testament that Satan was portrayed as Lucifer, the first of the fallen angels to rebel against God. In the New Testament, angels are present at all the important events in the life of Jesus. Here, they became more than just messengers; they are portrayed as the agents of God in bringing judgement to the world. Until the New Testament there were only two orders of angels; the Seraphim and Cherubim. St. Paul extended the number by adding seven new orders. They are, arranged according to their importance: Seraphim, Cherubim, Thrones, Dominations, Virtues, Powers, Principalities, Archangels and Angels. Archangels are higher in rank than Angels, but still they come eighth in the order of higher beings. Four of the most important ones are Michael, Gabriel, Raphael and Uriel. In Islam, it is believed that there are four Archangels who guard the throne of Allah. The Creator Himself is so powerful and glorious that He cannot be approached in person by human beings. He alone "hath immortality, dwelling in the light which no man can approach unto: whom no man hath seen, nor can see (1 Timothy 6:16). Angels do not have man's shortcomings, and can therefore act for God and represent Him when communicating with men and women. They bridge the huge gap between the holiness and perfection of God in heaven and the shortcomings of dying people on this planet. Angels were made immortal (that is, never to die). Their eternal quality was spoken of by Jesus when he said: "They which shall be accounted worthy to obtain that world, and the resurrection from the dead, neither marry, nor are given in marriage: neither can they die any more: for they are equal unto the angels; and are the children of God. being the children of the resurrection." (Luke 20:35.36) Jesus was saying that, in the same way as the angels (the children or "sons" of God) live for ever and are of one gender, so those who will be called the "sons" and "daughters" of God when Jesus returns will also live for ever and will not marry. Only occasionally are the angels given names. "Michael", for instance, was "the great prince which standeth for the children of thy people (Israel)" (Daniel 12:1). Undoubtedly, among the most significant of angelic appearances were those by the angel whose name was "Gabriel". He was sent twice to the prophet Daniel. On the second occasion Daniel was at prayer, and Gabriel, "being caused to fly swiftly, touched me ... and talked with me" and proceeded to prophesy the date of the first coming of the Messiah, Jesus Christ (Daniel 9:21-27). There was therefore great expectation among the Jews at the time when Jesus Christ was about to be born, and this was heightened by the personal appearance of Gabriel again, firstly to Zacharias the priest while on duty in the temple, and then to Mary, who was betrothed to Joseph. To Zacharias, the angel announced. "I am Gabriel, that stand in the presence of God: and am sent to speak unto thee" (Luke 1:19). We notice that angels can stand in the glorious presence of the LORD. whereas men cannot. and angels are sent to do whatever God wishes. His mission here was to announce the miraculous birth of John the Baptist. Six months later, Gabriel appeared to Mary, who was in the royal line of King David. Her prayer, said the angel, had found favour with God, and she would be the mother of the expected Messiah. Gabriel told her that she would conceive through the power of the Holy Spirit and her son would be Jesus, the Saviour, and he would be the Son of God and would occupy the royal throne of David (Luke 1:26-33). It was an extraordinary meeting because Mary was not yet married. Nothing is impossible with God! Joseph, her husband-to-be, also received angelic messages advising him what steps to take in this unique situation. No evil shall befall you, nor shall affliction come near your tent, for to His Angels God has given command about you, that they guard you in all your ways. Upon their hands they will bear you up, lest you dash your foot against a stone. Psalm 91: 10-12 A heavenly spirit assigned by God to watch over each of us during our lives. The doctrine of angels is part of the Church's tradition. The role of the guardian angel is both to guide us to good thoughts, works and words, and to preserve us from evil. Since the 17th century the Church has celebrated a feast honoring them in October throughout the Universal Church. Since the last calendar revision this feast is Oct 2. Fr. Frederick William Faber, who followed John Henry Newman into the Catholic Church in 1845, succinctly and eloquently describes the guardian angels' relationship to us in “Hymn to My Guardian Angel”. "Dear angel! Ever at my side. A guilty wretch like me." All angels, having no bodies, are pure spirit. Although the Fourth Lateran Council defined the presence of angels, belief in the guardian angels is implicit in Scripture (as we have seen) and has rich history in Sacred Tradition. Early Church fathers differed in opinion about when a guardian angel is actually assigned — at birth or at baptism. Origen shows scriptural basis for both opinions.10 While the Church leaves this question open, most of the Fathers held that all men, baptized or not, have a guardian angel. However, those who have the “indelible mark” of baptism and a new life in Christ require more attention, guidance and protection to ensure that they will reach heaven. The Church has taught over the centuries that every angel in heaven has one chance to become a guardian angel, from the seraphim down. The angel has to “lower himself” to serve his protégé on earth, but in so doing learns more about the Incarnation. 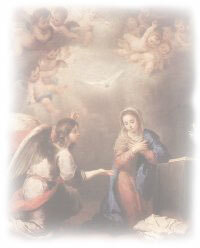 Every Mass at which a human assists provides an awesome opportunity to his guardian angel, to behold the Incarnate God. Holy hours in front of the Blessed Sacrament are also delightful experiences for our protectors. Other ways to foster a relationship with one’s guardian angel includes praying to the angel to intercede for us and engaging in conversation. To this end, naming the angel may be helpful, but the angel’s name is inexpressible in human language. If one is to take the trouble giving his angel a moniker, it should conform with revelation. Whenever angels have appeared in Sacred Scripture in human form, it has been in male form only. Since angels have no gender, this is somewhat puzzling. However, we need to conform to public revelation. The guardian angel simply has one task that has many facets — to lead the human to the Passion and Cross. Embracing the cross is the only way human beings reach heaven. He does this mainly through pricking our conscience so we can follow the will of God. He encourages us to thank God for the many humiliations we receive daily, even when his voice is being drowned out because the fallen one is helping to stir up our pride and roars in our ears. Guardian angels do this indirectly working through the imagination and memory. A secondary role is to physically protect. We might notice this indirectly. For instance, we might not be able to locate an item, which then detains us. Only later do we learn that we would have likely been in danger had we not been detained. Today’s society does much to roar in our ears and keep us from becoming holy. As Jesus inferred to Peter11, we are like sheep. Anyone who raises these animals knows that anytime a person walks into a barn, the whole place has the deafening din from their bleating. The sheep think they are hungry, even if they ate an hour before. A good shepherd knows that feeding sheep too much “junk food” or too often will only make them fat and lazy. Despite some modernist priests’ claims otherwise, humans are still like sheep in this sense. We need to be fed, and we need to be led to safety. Those who live in in the world without someone to lead them to safety are akin to a herd of cattle that Laura Ingalls Wilder described after an early fall blizzard in the Dakota Territory. Angels have been depicted13 as hovering over a terrified sheep and preparing to free the animal from entanglement from brambles. In much this way, guardian angels can help to serve as guides in this world. It is much easier, however, if we cooperate with the guardian angel. We often struggle in our sin, only to be further trapped and have its barbs dig deeper. It behooves man to pay attention to his angelic protector. Failing to take advantage of all God provides him to ensure he embraces the cross brings the risk that the angel he will face in eternity is the evil one. Christine J. Murray writes from Mount Pleasant, Michigan. 9. St. Basil, Adv. Eunomium III, 1: pg 29, 656B. 10. Commentary on Matthew 12, 27-28. 12 The First Four Years, Harper and Row, 1971, p 41. 13 Description is based on cover art for prayer pamphlet, including Invocations to the Holy Guardian Angel and Litany of the Guardian Angels, available at Gethesamini Chapel of Adoration, 13770 Gratiot Ave., Detroit, Michigan 48205. This does not mean that the first of the human race had exactly the same physical nature as the angels, for the angels were made to live forever. Adam and Eve were not made never-dying: they did sin, and they suffered death as the punishment for it. That is why the whole human race has been dying ever since. The New Testament quotes this passage, and tells us that mankind - including the Lord Jesus himself - was made a little lower than the angels, "for the suffering of death" (Hebrews 2:9). Angels do not die, but men and women do. Even Jesus, the Son of God, was a mortal man, but has now received the glory and honour which was his due when, as he said after his resurrection, "all power is given unto me in heaven and in earth" (Matthew 28:18). These beings, because of pride, did not return God's love. God did not destroy them, but permits them a limited scope of activity. Their condition is permanent for no creature can turn away from the perfect good of the beatific vision once he has come to enjoy it, and no additional reflection could change the mind of a purely spiritual being who has turned away. Demons are fallen angels under the command of Satan, those who are still free after the Gen. 6 affair. Satan is called the Prince, or Ruler, of all demons in Matthew 9:34; 12:24; Mark 3:22; Luke 11:15. Demons are also called the ministers, or ambassadors of Satan, Luke 4:35; 9:1,42; John 10:21. Satan is brilliant, an administrative genius. He has an excellent organization, mentioned in Eph. 6:10-12 (READ) The Bible also makes a distinction between demon possession and demon influence. Special thanks to catholic.org for their information. There are four angels and their innumerable retinues in charge of this world. The first is Gabriel and his armies. He is in charge of soldier-angels and revelation. Gabriel insures victory and is responsible for the extinction of nations: human, animal, vegetal, or others, when God wills it. The second is Michael and his armies, in charge of rain and vegetation. He conveys sustenance to nurture mankind. The third is `Azra'il the angel of death and his assistants. They are in charge of seizing the souls of those who die. The fourth is Israfil and his assistants, in charge of the Hour of the Day of Judgment. When the earth has passed away God will order these angels to bring forth their scrolls and they will bring them. Then God will order them to open the Book of Life. They will then find that their scrolls are the same as it. I have Permission By Lynda!